The freshly announced arrangement covers a sales and distribution partnership, and work on a race car. What does it mean for investors? Cypress Semiconductor (NASDAQ:CY) and Arrow Electronics (NYSE:ARW) recently announced an expanded partnership for Internet of Things development. The companies will collaborate on tech and marketing, and the deal also involves Arrow's IndyCar sponsorship. Cypress has historically been a provider of digital memory chips and microcontrollers. In the last few years, though, the company has expanded its scope to become a builder of integrated wireless systems. Last summer, the company bought the WiFi and Bluetooth IoT arm of Broadcom for $550 million in cash. With it also came a software ecosystem for developers working in the space. Cypress Bluetooth Pioneer Development Kit. Image source: Cypress Semiconductor. The purchase helped Cypress pivot to its new business focus. 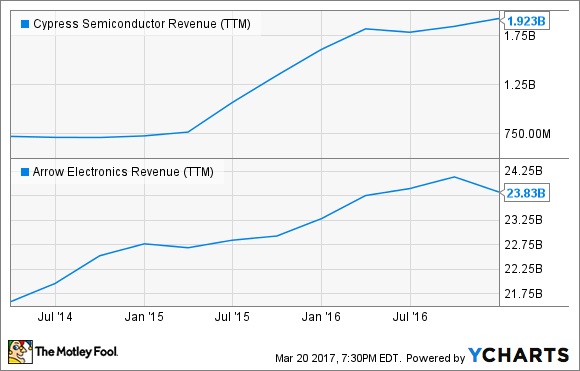 Dubbed Cypress 3.0, the strategy is to expand into high-growth areas in the semiconductor space. One of those areas is the automotive world. A recent note from CEO Hassane El-Khoury mentioned that the semiconductor industry is growing at about 3% a year, but chips for driver-assistance technology, connected cars, and infotainment systems were growing at 18.8%, 14.1%, and 8.7%, respectively. "We believe expanding our partnership with Arrow will help Cypress build our leadership position in IoT connectivity and strengthen our reach in the fast-growing segments we focus on most in our target markets. Not only will we benefit from Arrow's technical, sales and logistics expertise, but we will collaborate on more marketing opportunities as well." What does this arrangement have to do with IndyCar? Arrow Electronics Honda Car No. 5, now co-sponsored by Cypress. Image source: Cypress Semiconductor. Arrow is the primary sponsor of the No. 5 Honda race car in the IndyCar race series. Cypress was invited by Arrow to be a joint sponsor for the race team. More than just providing financial support, though, Cypress and Arrow will use the event to test their IoT capabilities, especially those surrounding connected auto. Technology is an important part of motorsports. The track is often a testing ground for new ideas, parts, and materials that eventually make their way into production vehicles and other industrial applications. Connected devices could be another technology developed with the help of racing. Cypress will get to use its product on the IndyCar circuit, helping its team gain a technical advantage in-race. In turn, the demanding and high-stress IndyCar races will help Cypress refine its lineup of chips with the end goal of finding a bigger home for that technology in the real world. While the test bed for new IoT products is important, the sales and distribution agreement is of greater importance here. Arrow gets access to a portfolio of tech from a leader in the connected-device market. What Cypress gets could end up being even more critical. Overall revenue has gone up for Cypress after its acquisition last summer, but the impact from that new business has been less than expected. 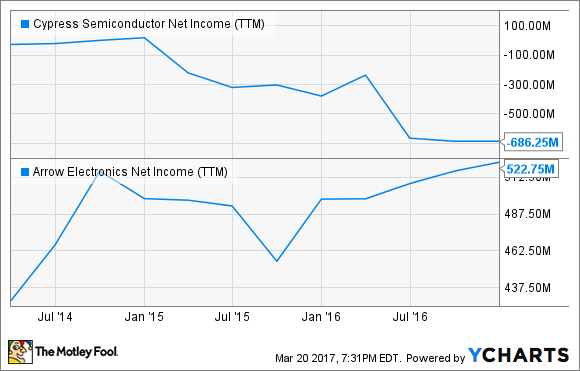 The bottom line also got hit due to the Broadcom purchase, making sales growth an even more critical game. Look for updates in the quarters ahead on how the new partnership is working out. Cypress investors will especially want to look for details on new sales and use opportunities the company has received from Arrow. At the rate use of connection-enabling devices in cars is growing, it's a relationship that could provide Cypress with a strong pipeline of growth for years to come.